Toshiba Spare Parts specialises in the supply of genuine Toshiba spare parts and accessories at great prices. Spare parts are available for Toshiba Laptop's, Netbook's, Tablet PC's and All-In-One PC's. 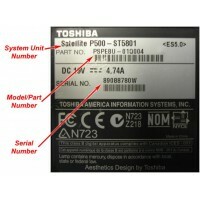 Parts are supplied to us directly from Toshiba's spare parts warehouse and come with Toshiba's full warranty support. 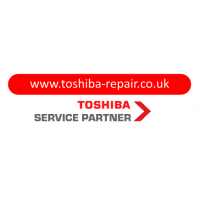 We are an authorised Toshiba Repair Centre. We can ship to the UK, Ireland, Isle of man, Guernsey, Jersey, France, Germany, Netherlands, Luxembourg, Belgium, Portugal, Sweden, Poland, Austria, Denmark, Spain, Czech Republic, Slovak Republic and Italy. To find the model-part number, look for the sticker on the bottom of your Toshiba laptop. If the sti..
Free Delivery on all Orders over £75 + VAT (UK Mainland Only) Free shipping with DPD, when you spend.. 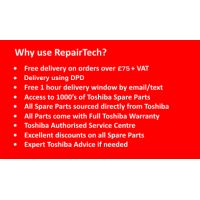 In January 2014, RepairTech Ltd was appointed as the only Depot Repair Centre for Toshiba in the U..
Are you looking for Repair for your Toshiba PC?Fully integrated into Toshiba European Service System..